Game of Thrones is so committed to killing off characters you like that it's pulling in actors from other shows just to keep up. In Sunday's Season 8 premiere, the show not only answered questions about what happened to singer Ed Sheeran's character following his Season 7 cameo. There were a pair of blink-and-you'll-miss-it cameos that saw popular comedians taken to visit the drowned god. Rob McElhenney of It's Always Sunny in Philadelphia and Martin Starr of Freaks & Geeks and Silicon Valley both popped up for just a second as Ironborn extras. They were aboard the ship of Euron Greyjoy when Theon arrived to save his sister Yara. 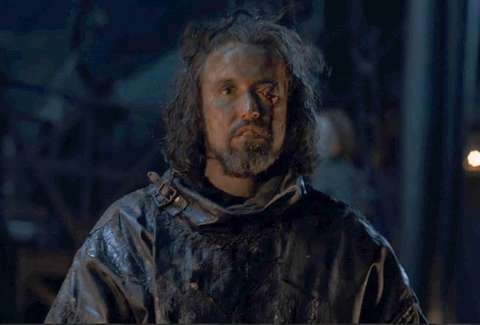 The more obvious of the two was McElhenney, who takes an arrow through the eye at the start of the scene. In a flash immediately after, Starr goes down as well. They both paid the price for supporting Euron or daring to grab a cameo on a show where characters die at an alarming rate. The It's Always Sunny actor teased his appearance on Instagram, writing, "Don't blink." Weirdly, this isn't the first time there's been crossover between It's Always Sunny and Game of Thrones. In 2013, Game of Thrones co-creators David Benioff and D.B. Weiss guest-wrote an episode of It's Always Sunny. These kinds of cameos seem perfect for the show if it's going to do them. It's a stark contrast to the protracted cameo Sheeran made during the last season.